Gorgeous gold bracelets for baby, toddlers, and children. 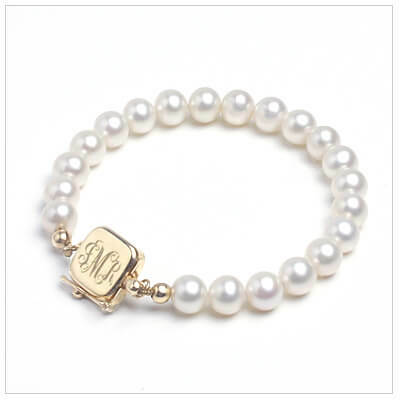 Our customized 14kt gold bracelets are elegant little luxuries and perfect for special occasions. 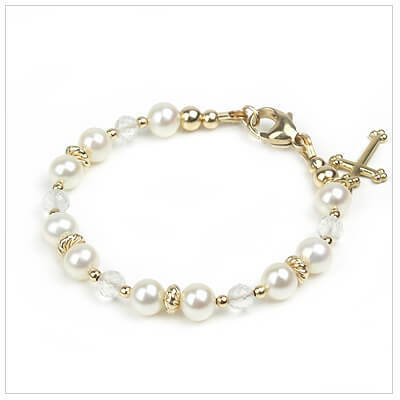 Our pearl and gold baby bracelets can be resized to grow with your child. Our gold baby bangles have hinged safety closures for security and are available in yellow or white gold. 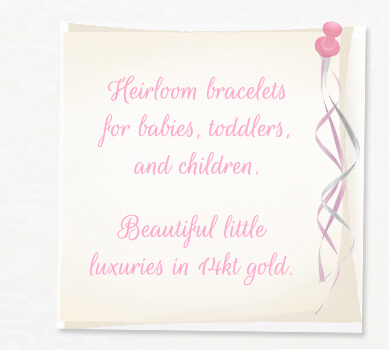 Beautiful gold baby bracelets in cultured pearls, pink crystals, and 14t gold. For baby and child. 14kt gold baby bracelets in cultured pearls, clear crystal, and sparkling diamond cut gold beads. Customer favorite! 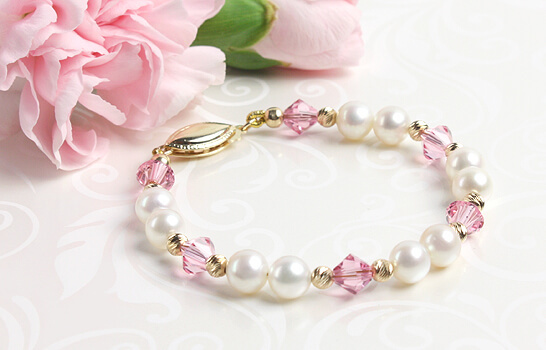 Fine gold baby bracelets in cultured pearls and crystal. Heavy wall gold beads. Irresistible gold baby bracelets with cube crystals, diamond cut gold beads, and cultured pearls. 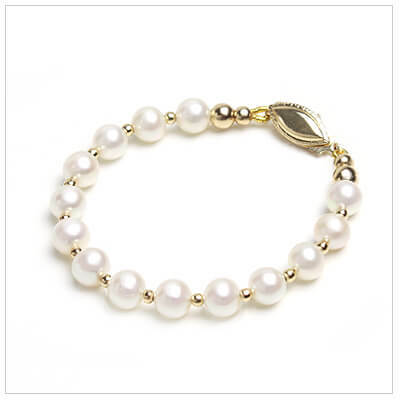 Classic pearl bracelet for babies and children with 14kt gold beads. Heirloom Baby Collection. 14kt Polished Gold Bangle Bracelet 4.5 in. 14kt polished gold bangle bracelet for baby and toddler. Safety hinge closure. Size 4.5 inches. 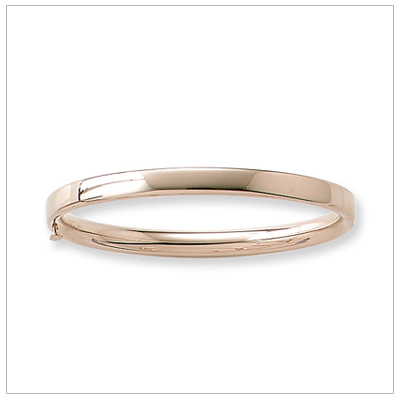 14kt Polished Gold Bangle Bracelet 5.25 in. 14kt polished gold bangle bracelet for children. Safety hinge closure. Child size 5.25 inches. 14kt White Gold Bangle Bracelet 4.5 in. Polished 14kt white gold bangle bracelet for girls. Safety clasp. Baby size 4.5 in. bangle bracelets. 14kt White Gold Bangle Bracelet 5.25 in. Polished 14kt white gold bangle bracelet for girls. Safety clasp. Child size 5.25 in. bangle bracelets. White Gold Diamond Bangle Bracelet 4.5 in. 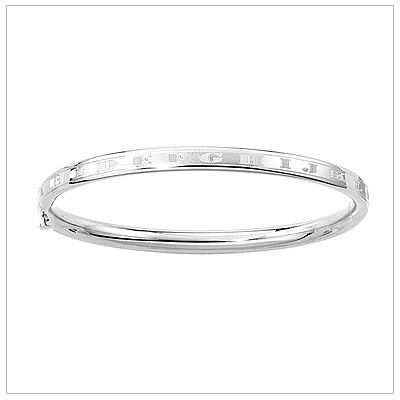 Polished 14kt white gold diamond bangle bracelet. Safety clasp. Baby size 4.5 in. bangle bracelets. 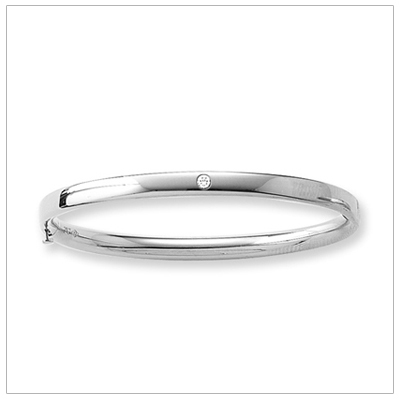 White Gold Diamond Bangle Bracelet 5.25 in. Polished 14kt white gold diamond bangle bracelet. Safety clasp. Child size 5.25 in. bangle bracelets. 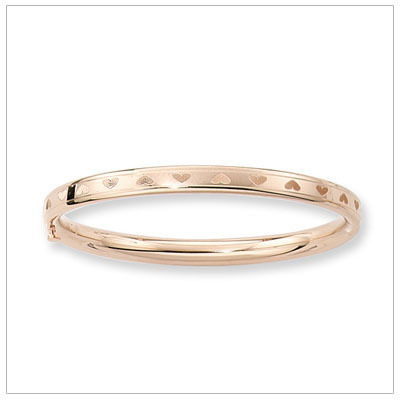 14kt Gold Hearts Bangle Bracelet 4.5 in. 14kt gold bangle bracelet with hearts all around. Safety clasp. Baby size 4.5 in. bangle bracelets. 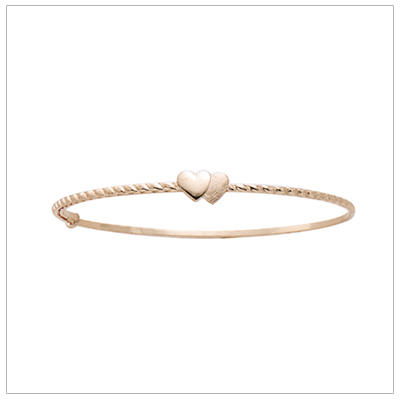 14kt Gold Hearts Bangle Bracelet 5.25 in. 14kt gold bangle bracelet with hearts all around. Safety clasp. Child size 5.25 in. bangle bracelets. 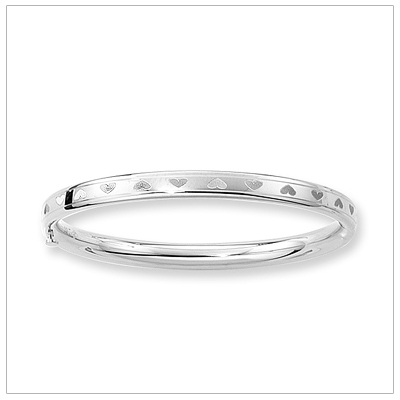 White Gold Hearts Bangle Bracelet 4.5 in. 14kt white gold bangle bracelet with hearts all around. Safety clasp. Baby size 4.5 in. bangles. 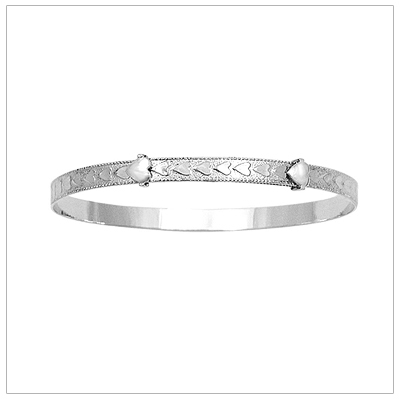 White Gold Hearts Bangle Bracelet 5.25 in. 14kt white gold bangle bracelet with hearts all around. Safety clasp. Cild size 5.25 in. bangles. ABC 14kt Gold Bangle Bracelet 4.5 in. 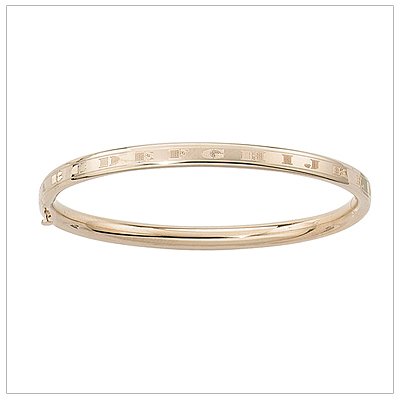 The alphabet is engraved around this 14kt gold bangle bracelet. Baby size bangles 4.5 inches. ABC White Gold Bangle Bracelet 4.5 in. The alphabet is engraved around this 14kt white gold bangle bracelet. Baby size 4.5 inches. 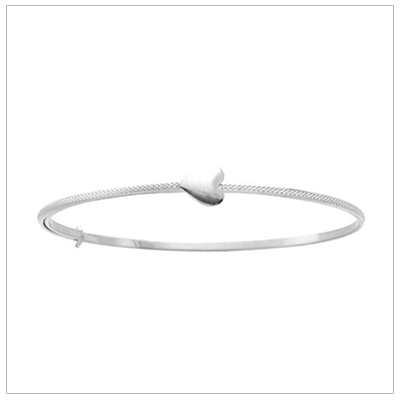 White gold bangle bracelets with textured band and polished heart. Adjusts for baby, toddler & child. White gold bangle bracelets with embossed hearts border. Adjustable for baby, toddler, and child. 14kt gold bangle bracelets twisted band and two small hearts. Adjustable sizing, 4.75 - 6.25 in.